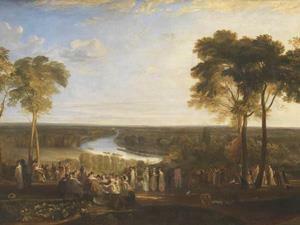 James Thomson, the Scottish poet who lived in Kew Foot Lane, Richmond from 1736 until his death in 1748, refers to the view in Summer (1727) - one of the poems from the cycle called The Seasons - giving the reader an indication of its extent:- "Here let us sweep The boundless landscape; not the raptur’d eye, Exulting swift, to huge Augusta send, Now to the sister-hills that skirt her plain To lofty Harrow now, and then to where Majestic Windsor lifts his princely brow. In lovely contrast to this glorious view, Calmly magnificent." William Wordsworth, in his sonnet June 1820 (1820), refers both to the nightingales for which Richmond Hill was once famous and are commemorated in the name ‘Nightingale Lane’ and to James Thomson:- Fame tells of groves – from England far away – Groves that inspire the Nightingale to trill And modulate, with subtle reach of skill Elsewhere unmatched, her ever-varying lay; Such bold report I venture to gainsay: For I have heard the quire of Richmond hill Chanting, with indefatigable bill, Strains that recalled to mind a distant day; When, haply under shade of that same wood, Local History Notes From Richmond Libraries’ Local Studies Collection Page 2 of 5 And scarcely conscious of the dashing oars Plied steadily between those willowly shores, The sweet-souled Poet of the Seasons stood – Listening, and listening long, in rapturous mood, Ye heavenly Birds! To your Progenitors.